The Microgaming-powered progressive jackpot slot game was probably one of the most anticipated games of 2012. Ladbrokes will give you £5 no deposit required to play on this incredible new Microgaming slot machine - you can play it for real or demo play immediately and can do so immediately. For a limited period at Ladbrokes Casino, Ladbrokes are offering you a 100% match bonus when you make your 1st deposit between €/£5 and €/£500 plus £5 free (no deposit required). 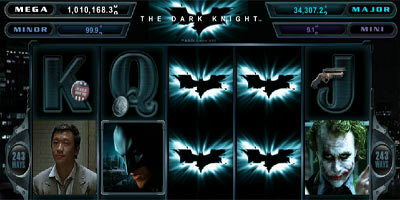 Batman is the Superhero in this Dark Knight video slot based on the Gotham City classic. The Dark Knight video slot is a 5 reel, 243 Ways Video Slot, with stacked Wilds, a special Batman and Joker feature that will add on extra awards, as well as Free Spins feature triggered by the Scatter. A Progressive Bonus is also part of this amazing new video slot with the possibility of winning one of 4 Progressive Jackpots. The Dark Knight slot game launched on the 28th of June – in a short space of time, the Mega Progressive Jackpot has risen to over £2.6 million. All two hundred and forty-three possible winning ways are permanently enabled. There is a 30x bet multiplier per spin. You can bet up to 10 coins per spin. Wild Symbol RulesThe Batman Logo symbol is a wild symbol. Does not substitute for the scatter symbol. Creates its own winning combination when multiple symbols appear on a pay way. Creates a symbol stack. Multiple symbols can display on a reel simultaneously, creating a symbol stack. This increases your chances of winning by substituting for other symbols to complete winning combinations. Multiple winning combinations are paid out per pay way. If there is more than one possible winning combination on a pay way, you are paid out for all wins. Scatter Symbol Rules The Joker Logo symbol is a scatter symbol. Scatter wins are calculated by multiplying the scatter symbols combination payout by the total number of regular coins bet. Scatter wins are added to regular wins. If you have a scatter win and a regular win, you are paid out for both wins, as the scatter symbol does not need to appear on consecutive reels to win. Three or more Joker Logo symbols scattered on the reels, activate the Free Spins bonus game. You are awarded fifteen free spins. All regular wins are doubled during the free spins. All the bets and pay ways played in the free spins are the same as the spin that activated the bonus game. The Free Spins bonus game cannot be re-activated during the free spins. Up to five additional free spins. The extra free spins are added to the remaining number of free spins. A 1x multiplier value. The multiplier value is added to the current multiplier value. You can win up to a 5x multiplier value. The bonus game cannot be re-activated during the free spins. The Progressive Jackpot bonus game cannot be activated during the free spins. If the Progressive Jackpot bonus game and the Free Spins bonus game are activated at the same time, the Progressive Jackpot bonus game is played first. Either Batman or Joker are displayed and award you a random prize. "Batman The Dark Knight video slot review, jackpot and no deposit bonuses"